Milk Chocolate Biscotti - Do You Know The Muffin Man? Notes: To make chopping the milk chocolate easier, I melted it, then spread it very thin on a cookie sheet lined with parchment. For the nuts, I used both ground hazelnuts and chopped walnuts. Because the dough has a sandy texture, I found it easiest to use my hands to press it together until it formed a log. I left the cookies in a turned off oven overnight, making them very crunchy. 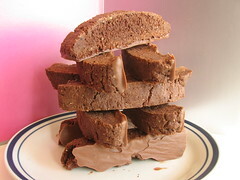 A dip in melted milk chocolate completed these biscotti. Very well received by my coworkers. Good for dunking in tea or coffee.